Now, let's take a vote! In top web comics, of course! Time for truth or dare! Realistically, I can't see anyone getting voted off right now. They should, however, vote off Levin asap. He's already proved that he will stab them all in the back at the earliest convenience. If he'd have kept his mouth shut about the others dying in a trap, in front of him, he might've been able to get away with a 'their word against mine' situation. Also, I don't think that the organisers (Smile co.?) could kill off the paladin or Infinite. Surely they'll be too powerful to kill using traditional means? Especially as there doesn't seem to be any restrictions on magic usage. 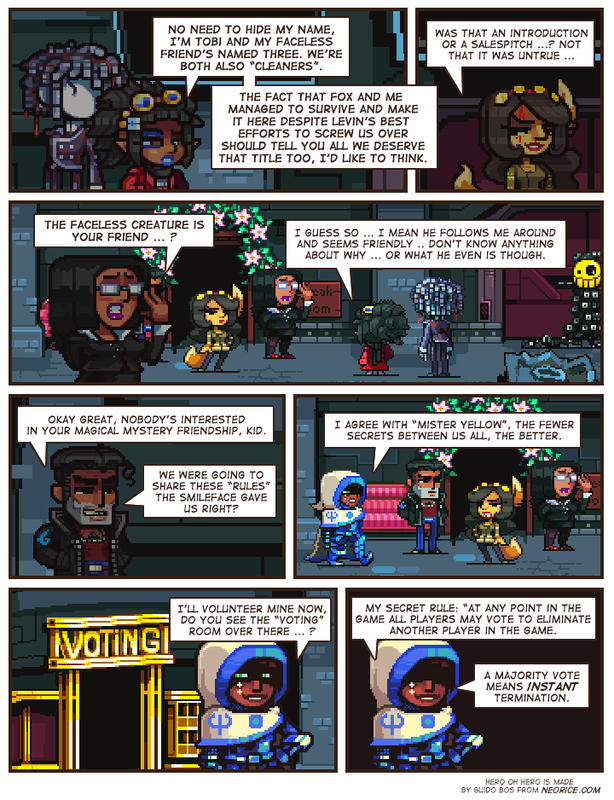 Vote for shalhia .Cause law enforcer/Paladins are always the worst. also her Flesh-Magic is really really gross. We don't know who or what the "terminator" is. Maybe it's some kind of gas, like used against Tobi already, or high-tech guns, or just moving walls. Or Mr.Mask-the-Smile can overpower anyone if triggered. For this reason I think that it wasn't smart (curse these dump stats) to reveal this rule. Even if they won't vote, this creates more tensions than necessary. @Conchord: Poison gas does alot of work. As does just blowing up a room where they're stuck in alone. As does informing the other of the two exactly -how- much of a threat the other is. was that actually her secret? "Nobody's interested in your magical mystery friendship, kid." You obviously haven't been reading the comments, fella. I'm gonna bet that the Paladin's gonna bar people from actually using that room. Her having a mandate to protect and all. @Chameon Poison Gas isn't controllable enough to just kill one person. It would kill anyone else around them too. The bomb room also wouldn't work as, after seeing everyone go vote, who would be stupid enough to enter a room alone? @Saiko, see above for gas. High tech guns could likely be stopped by Paladins flesh magic. Moving walls/ floors could be a goer though, I'll give you that. As a side point, we don't actually know what powers Infinite has, do we? 3's my third favorite character. He's awesome. I agree with Exasperation there.